King Fahara'jad was the ruler of Sentinel in the sixth century of the Second Era. He married Za-Rifah, the "Flower of Taneth", with whom he had three children: the eldest Maraya, the "Jewel of Satakalaam", his second-daughter Lakana, the "Star of the Almandine", and the young Crown Prince Azah, the "Lion of Antiphyllos". 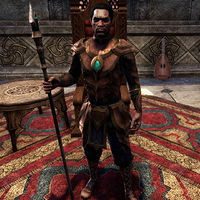 He was one of the leaders of the Daggerfall Covenant, and thus played a key role in the Alliance War circa 2E 582. According to the biography The All-Beneficent King Fahara'jad, when Fahara'jad was a prince of Antiphyllos, he hunted birds in the Garden of the Grandees. After he killed a crow, Onsi himself descended from the heavens to save the prince from a vengeful hagraven. The tale says Onsi intervened because Fahara'jad was prophesied to lead his people during the "Years of Peril" (of course, the only witness to this encounter was Fahara'jad himself). His daughter Maraya was married to King Emeric of Wayrest in the spring of 2E 566, resulting in a prosperous trade agreement between the two prominent Iliac Bay kingdoms (and a war between Wayrest and Shornhelm). Published excerpts from The History of Histories, As Told to Young Prince Fahara'jad include The True-Told Tale of Hallin and The Worthy Ar-Azal, His Deeds. The latter gives a history lesson for him on Ar-Azal, a former High King of Hammerfell and Fahara'jad's great-grand uncle. His lineage is further discussed in The Royal Lineage of Sentinel. Upon allying himself with the Daggerfall Covenant, Fahara'jad proclaimed himself High King of all Hammerfell. The southern city-states, such as Hegathe, considered the claim outrageous, but no one openly challenged it. Still, Crowns often called Fahara'jad a usurper, among other aspersions. It was rumored that a traitorous adviser named Suturah slew several of Fahara'jad's other advisers as part of an attempt on the king's life, which ultimately failed. When Suturah went on to threaten Sentinel with a necromantic assault, the king secretly turned to the Ash'abah tribe for help. This was a controversial move, as the Ash'abah were pariahs in Redguard society due to their own "unclean" practices with ancestral spirits, many would consider such a association to be "impure". Whatever the case, the undead army was defeated, a victory Fahara'jad publicly attributed to an intervention by the Divines. During the Three Banners War, Fahara'jad represented all the Redguards of northern Hammerfell, and he called on all "loyal sons and daughters of Alik'r" to defend the Covenant. He offered protection to any ships sailing under the banner of the Covenant, as well as bounties on the vessels and crews allied with the Aldmeri Dominion or the Ebonheart Pact. In 2E 582, the sons of Suturah plotted to take revenge for the death of their father. Their group of necromancers was called the Withered Hand, and they began to threaten the Alik'r with attacks from risen dead. After they stole the Ansei Wards from the Impervious Vault, Fahara'jad asked the Ash'abah for aid once more. As time passed, rumors about the Ansei Wards being stolen run rampant in Sentinel and both the Crowns and even some Forebears began calling for Fahara'jad to step down. Some claimed there was even talk of rebellion. His unpopularity reached the point were he couldn't go out in public without being heckled. Eventually, the Ash'abah retrieved the Ansei Wards and ended the undead threat to the Alik'r.